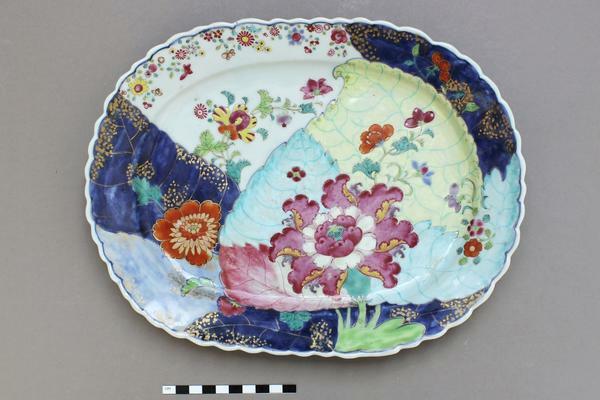 My first and most enduring project since joining the West Dean College Ceramics Conservation Department has been the tobacco leaf platter (see Figure 1). It is through this object that I have learnt most of the skills that I will take away at the end of my graduate diploma year and it is, therefore, fitting for it to be the subject of my post. 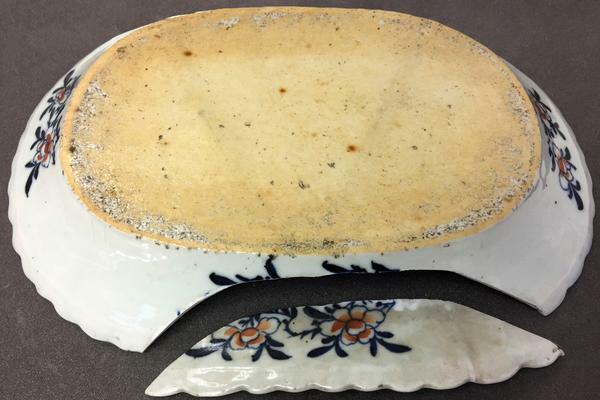 Researching the tobacco leaf dish has opened up a fascinating history to me. The tobacco leaf pattern, in fact, has little to do with the tobacco leaf. It is thought that the design was inspired by patterns used on Indian textiles and 17th and 18th-century damask fabrics, which feature similar lobed leaves and hibiscus style flowers. Previous Sotheby's sales estimated the date range of similar items to be 1775-1785. This places the dish firmly in the Qianlong period (1736-1795) of the Qing dynasty. 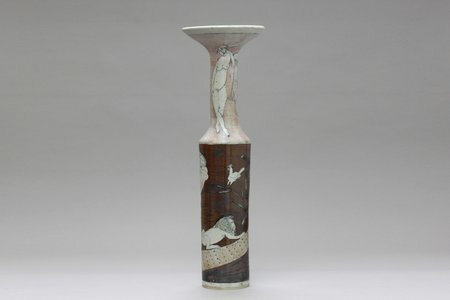 This was a prosperous and organised time for ceramic production in China in the Qianlong period driven in part by the prolific export of Chinese ceramics to the West due to the fashion for collecting. The platter came to me in two pieces and had a metal display hanger attached. The platter had some areas of loss along the breakline and was dusty. Through careful observations and some gratefully received tips from my tutor, it was decided the platter was porcelain. The design featured overglaze enamels and gilding which through research and testing I understood to be very vulnerable to damage. 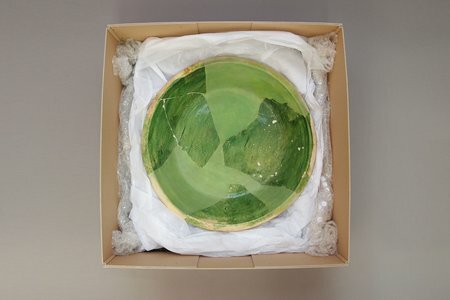 The owner requested the platter to be bonded so it could be displayed again. 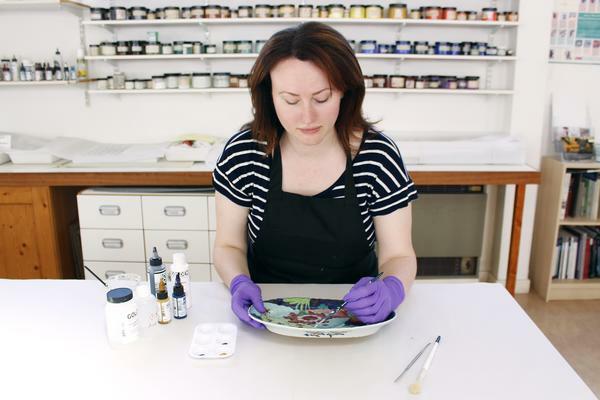 I, therefore, needed a treatment plan that would be informed by the owner's requests and historical values as well as the material aspects of a porcelain body, overglaze enamels and gilding. 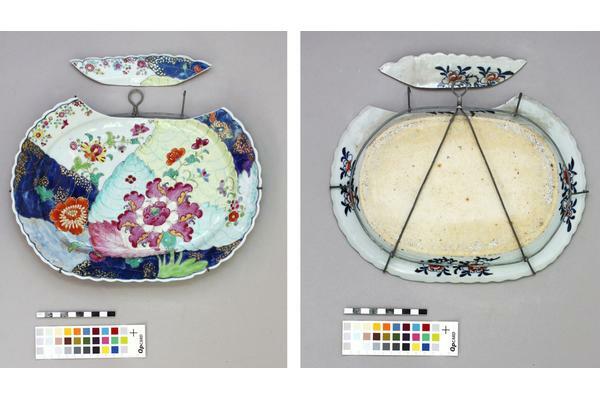 Firstly I needed to remove the metal display hanger, luckily West Dean's Metals Conservation Department was able to oblige and removed it with no damage to the platter or hanger by unhooking it. My next task was to clean the platter. I tested a range of solvents (Industrial Methylated Spirit, acetone, and a cleaning solution consisting of 80% de-ionised water + 20 % IMS (industrial methylated spirit) and a few drops of pre-diluted Synperonic™ A7 non-ionic detergent,). Cleaning with deionised water and the cleaning solution (removed with deionised water) was sufficient to clean the surface. The solvents were both applied with cotton wool swabs allowing control of the cleaning. 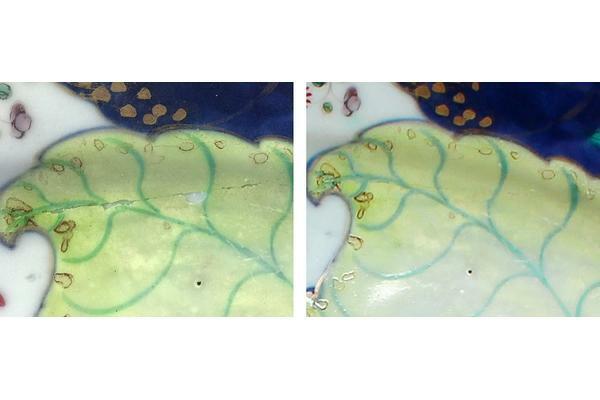 A steam cleaner was used along the break line to make sure it was free of dust and dirt, however, it was localised so the overglaze enamels and gilding were safe. I was now ready to bond. My time in the science lectures allowed me to understand that porcelain is high fired and therefore non-porous, giving a smooth and glassy break edge. A strong adhesive like an epoxy is therefore needed as it forms strong secondary bonds to hold the two sections together. 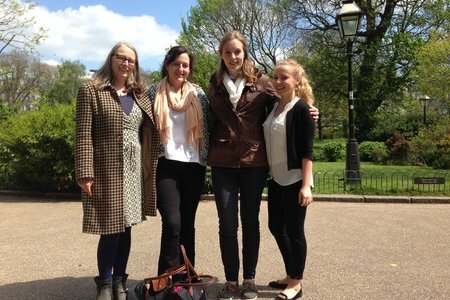 I chose to use Fynebond®. The low viscosity allowed the application of the epoxy through capillary action. The two sections of the platter were taped together tightly and the epoxy was dotted along the break line with a cocktail stick, allowing it to travel into the joint via capillary action. I did not fill all areas of loss on the platter as my aim was not to recreate the platter as new but to keep its age and historical character. Smaller areas which didn't require a full colour fill were consolidated with a 10 % Paraloid solution to ensure they were stable. The tobacco leaf platter has taught me not only about the tangible values of materials and techniques but also the intangible aspects relating to the sentimental value inferred on the platter as well as its vibrant history and age values.